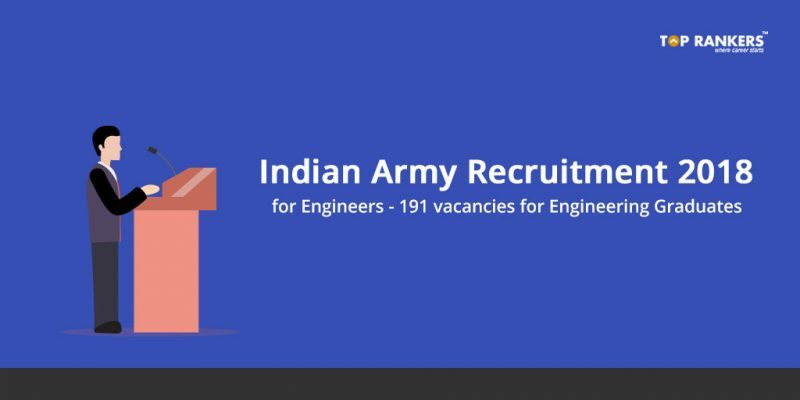 Indian Army Recruitment 2018 for Engineers is out for 191 vacancies for Engineering Graduate. This is a great oppurtunity for all the engineering students wanting to join Defence forces. The online application process was started on 17th January 2018. All the candidates are required to fill the application form latest by 15th February 2018. In this article you can learn about various important dates, Eligibility criteria, Payscale and a direct link to application for Indian Army Recruitment 2018 for Engineers. You can apply for any one Engineering stream only. Minimum Age for SSC(T) Men & SSCW (T) Women is 20 Years. Maximum Age SSC(T) Men & SSCW (T) Women 27 is years. Applicant should be BE/B.Tech in any stream from a recognized university. Candidate should be in the Final Year of Engineering and should be able to produce proof of passing by 1st October 2018 and produce Engineering Degree within 12 weeks of joining at Officers Training Academy (OTA), Chennai, Tamil Nadu. You should be graduate in any discipline from a recognized university. You should be BE/B.Tech in any stream from a recognized university. For Asssamese/Gorkhas/ Nepalese/Garhawalus minimum height Relaxable by 5 cms. For residents of Lakshwdeep minimum height is Relaxable by 2 cms. Weight should be In proportion to the height. Candidates can apply from the Official Website of Indian Army. Go to ‘Officers Entry Apply/ Login’. Click on Direct Link to Apply. Stay tuned for more Recruitment updates and notifications. If you have any query or suggestion, Do write us in the comments below.